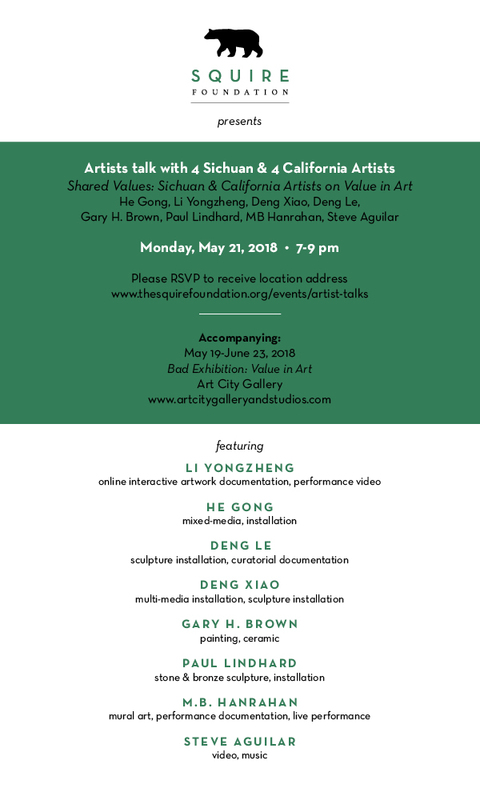 This talk facilitates cultural and artistic exchange between Chinese and US artists. The discussion will focus on ‘shared values’ as a form of ‘manufactured consensus’, serving ultimately to direct art markets by affixing high monetary value to artworks deemed ‘good’, and low monetary value to artworks considered ‘bad’. We discover where value may actually derive, if not top-down from high-end art markets. Perhaps a more relevant value may be found in relationship of the artwork to its creator, as part of a larger body of work, or to society, or even to present and future audiences. 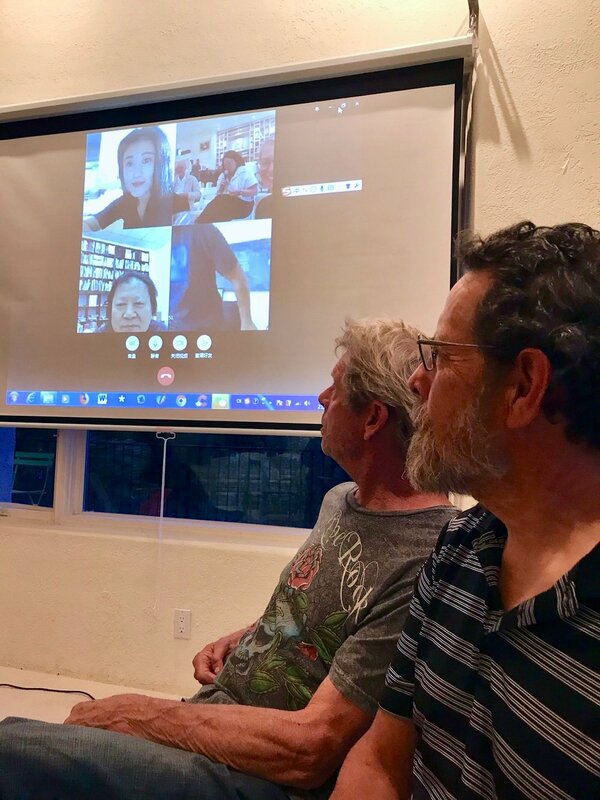 The talk was hosted by The Squire Foundation in Santa Barbara, California on Monday, May 21st, 2018. Article from May 18, 2018 Voice Magazine. While we may expect Chinese and US artists to agree on some shared values, we may discover a great deal of disagreement upon values grounded in starkly difference aesthetic ideals. These contrasting views, once discussed in detail, may reveal how Chinese artists relate to art very differently than their US counterparts. Whereas Chinese artists as a rule contextualize their creative practice within socio-political and economic systems; US artists focus on individual expression, freedom from normative controls, and innovation. What both Chinese and US artists bear in common, however, is a burdening global art market which acts upon artists regardless of their nationality. This global art market pressures artists to brand their own expression, ‘scolding’ them for lack of commitment to a single artistic medium or otherwise singularly narrow visual language. Click here to go to the Art City Gallery & Studios website to learn more. Li Yongzheng — Video documentation of performance-based installation, New-media art. Born in 1971 in Bazhong, Sichuan, Li Yongzheng pursued higher education at Sichuan Fine Arts Institute’s Department of Technology and Department of Oil Painting from 1989 to 1991. In 1994, he graduated from the Department of Fine Arts of Southwest University (formerly Southwest Normal University). From 1998 to 2000 he attended workshops at Department of Sociology of Sichuan University while living and working in Chengdu, Sichuan. His most recent exhibitions include: “Hello” at MOCA Chengdu in 2017, and “Death, I’ve Dreamed of You Many Years” at TEDA Contemporary Art Museum (Tianjin) in 2015. His recent selected group exhibitions include: “Today’s Past” at the 2017 Anren International Biennale; “Stress Field” at the Hubei Museum of Art’s Fourth Art Literature Exhibition in 2017; “Supply and Depression” at Nanjing International Art Thematic Exhibition in 2016; “Rock Bottom” at the Yinchuan Museum of Contemporary Art in 2015; “New Field of View” at the Taiyuan International Sculpture Bienalle of the Taiyuan Museum of Art in 2015; “Everyday’s Name” Blue Roof Art Festival Thematic Exhibition at Chengdu Blue Roof Gallery in 2014; “Extend” at Datong International Sculpture Biennale in Datong, Shanxi in 2013; “Confronting Anitya – Oriental Experience in Contemporary Art” at the 55th Venice Art Biennale 2013 in in Venice, Italy;” Voice of the Unseen” at the 55th Venice Art Biennale 2013 in Venice, Italy and more. During the Cultural Revolution, He Gong was sent to the countryside for seven years to do manual labour. That experience, he says, “made me realize the true condition of China” and ignited his hatred of ideology and political control. In the mid-1980s he went to the United States to study—ironically, one of the first Chinese artists to do so with government support. It was a turning point: for the first time he was free to choose what he wanted to do. One day he came across an old railway station, preserved intact for a century. “It was all black and grey with age. It took me back to the past. It was like going back to the origin of things,” he recalls. At that moment, he decided to abandon the use of colour: “Black and white represents the original state of being. It’s about dream and reality, contradiction and conflict.” His series The Occasion recaptures his memories of that vision in four huge paintings, each more than two metres square and covered with cobweb-like meshes of brushstrokes. Close up, the canvas looks chaotic, yet with distance recognizable forms emerge. When monochrome became trendy, He Gong began using colour again. Graduated from Central Saint Martins College of Art and Design in 2010. I consider myself to be primarily a painter draughtsman. My Grandfather and Father were painters and supported my interest in art. My other Grandfather shared his knowledge of the ancient world and of the native Americans both North & South. Drawing, journaling and gardening are my artistic practice. Born December 19th, Evansville, Indiana, 1941. I have participated in numerous group shows, judged shows, publications/books and am represented in museums and private collections. As a Professor of Art at the University of California I taught in the Art Studio Department and the College of Creative Studies for forty years and as Emeritus the summer program for another seven. After 47 years I finally graduated and I am now a full time artist & gardener. 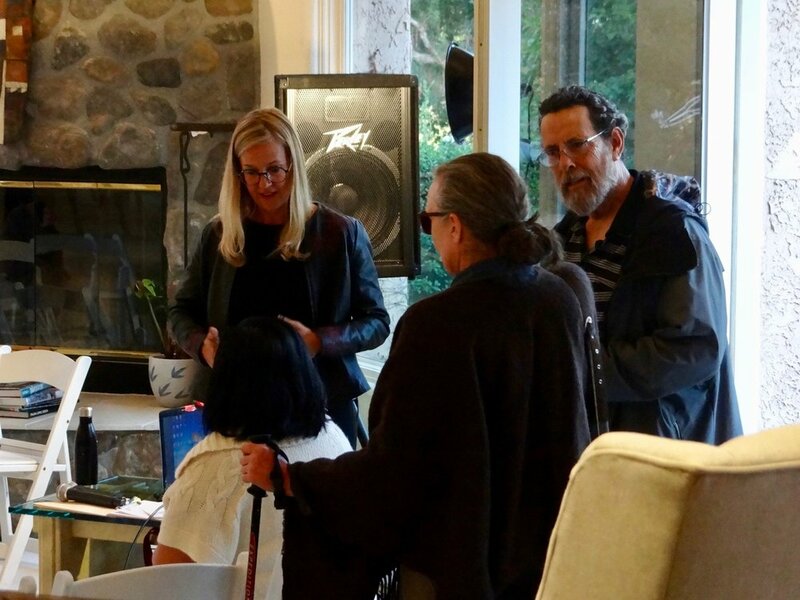 Artist, sculptor, studio builder, producer and patron of the arts for 50 years, Paul Lindhard’s Art City Gallery and Studios spans 31 years of art history in Ventura, CA, USA. Lindhard has housed four galleries, and as well hosted and supported six other creative community assets, i.e. Ventura Artists Union and Arts Council galleries, including Momentum Gallery, City Hall Gallery & Collection, as well as the Ventura County Government Center Gallery . The Art City/ Paul Lindhard stamp is focusing on completion of Ventura’s Western Gate, with a sculptural entrance piece consisting in multiple installations with intertwined connection to the historic Serra Conservancy. Also, and more recently, Lindhard has sculptural installations in Ventura’s new Botanical Gardens. Art City is actively working with the Museum of Ventura County in seeing through an outstanding public art commission. This artwork will engage Mission Park with the community at the Museum and Mission, completing a vital Downtown Ventura center. This is a legacy worth partnering on. With these projects in the works, Lindhard has refitted the Art City Gallery and resumed showing the work of studio artists and community members as well as recent examples of his own sculptural artwork. A remarkable development is evolving with the creation of space for visual, performance, film, sound and light-projection art. This is a journey of making art, presenting art and attracting people to the experience created. The new gallery and outreach investment in Ventura arts has both solid foundation and momentum. 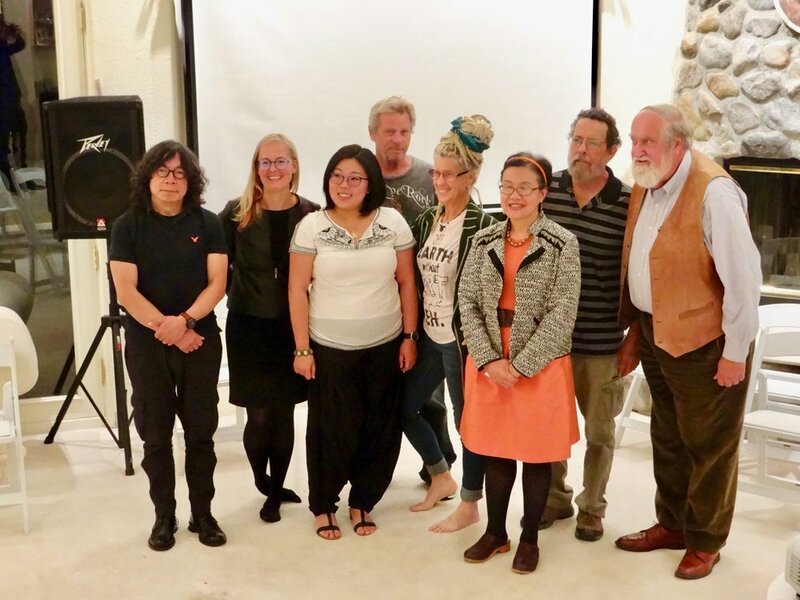 Lindhard was recently awarded the Ventura Mayor’s Arts Award in the Arts Patron category (November, 2017) in affirmation of a life practice devoted to cultivating talent and technique in not only stone sculptors, but also film makers, playwrights, poets, performance artists, painters, wood-carvers, photographers, and other artists working in found art, assemblage and multi-media. If there is something unique about my artform, it would be that I accommodate the opportunity, and devise the art approach best suited to create an impact. My "art form", which manifests as many art forms, is generally participatory, employs materials and methods in effective but unusual ways, pushes the "envelope" of the institution involved, and is completed by an audience. The crowning glory of making an ArtCar is the reaction of people as you drive by. Murals reflect and enhance their geographical location. My photos are printed and mailed as holiday cards. What the community/student projects lack in polish, they overcompensate in revealing the creative spirit in persons underserved by formal arts access. The projects that have historical or political content engage those previously uninformed. Atlanta native, Kevin Carman is a self-taught multi-medium artist who has been creating and exhibiting nationwide since 1994. His compelling works have received honors in both solo and group exhibitions alike. He travels far and wide to collect materials and inspiration to produce on site mosaic and sculptural installations, as well as other various private commissions. Through the use of unique materials, color, texture and multiple techniques; powerful thought and emotion evoking themes are visualized. Carman's work, concerned always with nature and balance, conveys a sense of harmony and peace. Kevin's work can be found from the LA Riverbanks to the Florida Coastlines. His talent has also been showcased as one of the international artists appearing in Maggy Howarth's book, " The Complete Pebble Mosaic Handbook". Currently Kevin has a residency at Art City Studios in Ventura, CA where he shares in the creative experience of an internationally renowned group of artists.